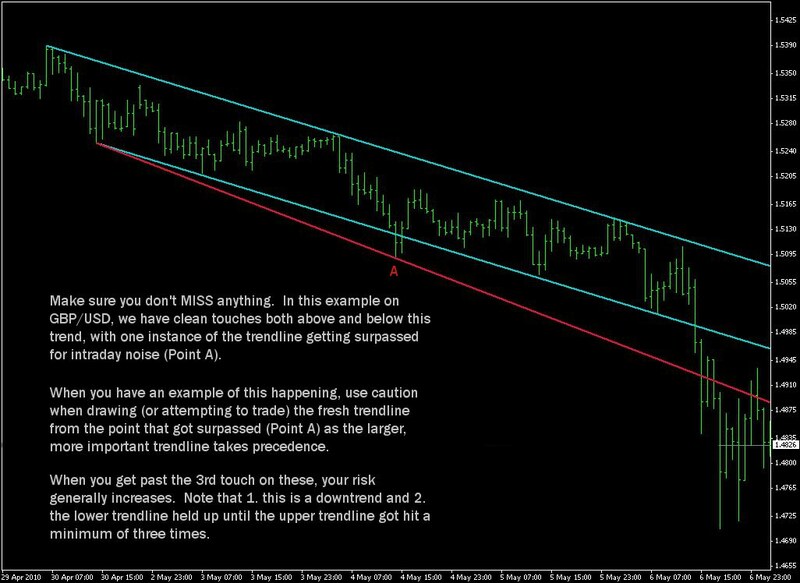 Diagonal trendlines can help us out tremendously when it comes time to entering and riding out an existing trend or entering a new one, but oftentimes deliver ambiguity and become confusing to a lot of traders who don’t know how to handle them properly. Questions arise as to whether or not people should even be using them, but a simple glance at a chart will tell you that they do in fact get monitored heavily as price has tendencies to bounce right off of them. Diagonal trendlines, with horizontal support and resistance, are one of the more widely looked after technical aspects of trading. In other words, the majority of traders across the globe monitor them for the same, sole purpose of defining price action and where to place trades. The confusion with diagonal trendlines, as we have explained in previous articles, is that uncertainty oftentimes arises over which lines get honored (faded) vs. those that breakout. 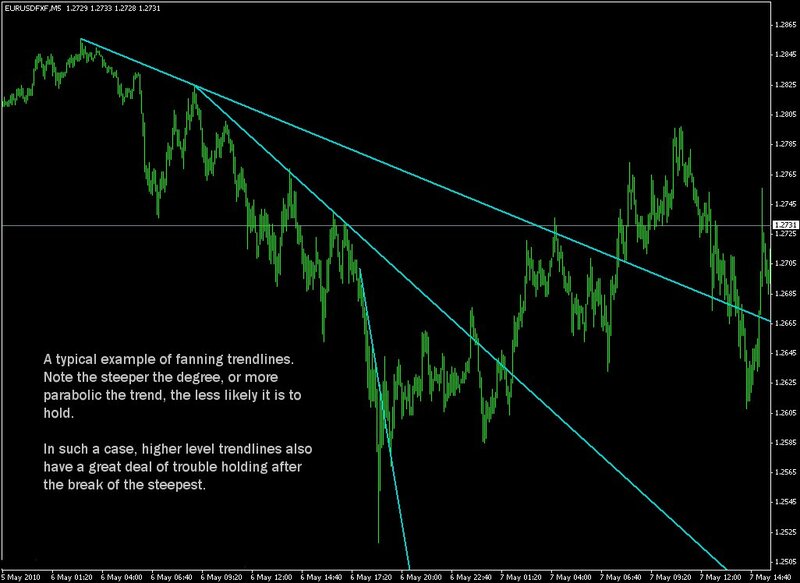 Here, I’ll explain the different types of diagonal trendlines and when they work best. When used properly, we can either ride out existing trends or catch reversals. Below is an outline of what to look out for. The first major rule when using diagonal trendlines is that when you are drawing them, they must be absolutely clear to the rest of the world. Ambiguity is not a word we like in trading. It takes two or more points in order to establish a diagonal trendline, which means that if it is honored again, it’s going to happen on the 3rd, 4th, 5th, etc. time. For a downtrend, you’re connecting lower highs and/or lower lows, and conversely for an uptrend, you’re connecting higher lows and/or higher highs. They’re visible on virtually any timeframe, though regardless of the timeframe the rules, in terms of when they are likely to be respected vs. not, don’t change. 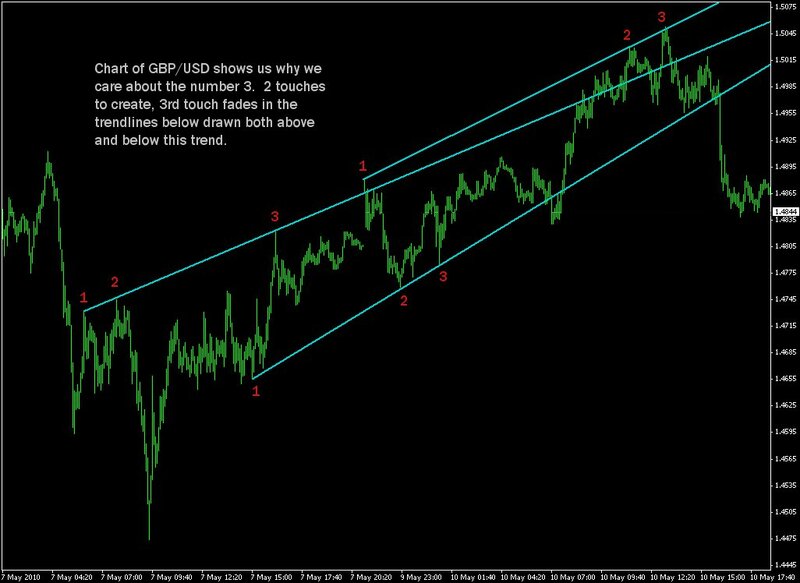 Fanning trendlines means to draw several trendlines in one direction, all with progressively steeper angles. Oftentimes trends will accelerate in terms of momentum, creating a sharper degree of price action. In order to compensate you want to draw multiple lines stacked on top of one another in order to assess all possibilities of trend continuation. As a general rule of thumb, the steeper the trendline, the less likely it is to hold. When you are drawing your third or fourth consecutive trendline, all at steeper angles, you can expect that the lower ones will eventually break. When fanning trendlines, it’s very important to be precise in your connections of highs or lows. FX is an extremely technical market. Oftentimes overlooking just a couple of pips is all it takes for you to miss something that someone else of influence is seeing. Essentially, you don’t want to be sloppy when drawing your lines. Accuracy and careful analysis pays. When you are looking to determine whether or not a trendline is likely to hold vs. breakout, there are several things to look for. All of the below items should be considered when attempting to ride an existing trend or play a breakout / retest. Just being aware of these factors alone should help anyone out tremendously in their understanding of why certain occurrences are happening from a technical perspective; being alert and aware of all factors is key in trading, and when it comes to diagonal trendlines, the rules are no different. As previously stated, the steeper the angle of a trendline, the less likely it is to hold. When you’re “fanning” trendlines and price is in a steep and steady uptrend, don’t expect the steepest of these lines to hold the further you get to the top. The same is true for a downtrend, of course. Look for lines that are less sharp if you’re looking to fade them directly. When price becomes parabolic, look for backward bounces/retests for reversal. 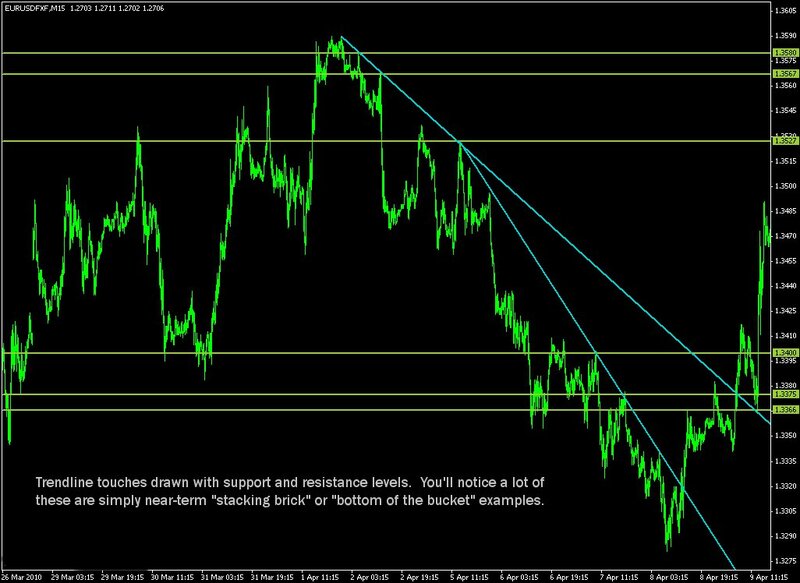 Just like horizontal support and resistance levels, the more a trendline gets hit, the less likely it is to hold. It’s a common theme that is more or less standard and follows through not just any type of trendline but a variety of other technical indicators; things only work out so well for so long. Typically, the number 3 comes into play as you’re looking to fade them on the 3rd touch or play a breakout after the 3rd touch. These conditions, and this number, could vary based on other factors described here. Lower lows (for a downtrend) and higher highs (for an uptrend), tell us a lot about whether or not the trendline is likely to hold. When a downward-sloping diagonal trendline is being approached, check to see if the current trend is registering significant higher lows or not. Lower lows indicate continuation of the current trend. Higher lows potentially disqualify the current trend and let the trader know that it’s time for price to take a breather. When a diagonal trendline is being approached, one of the first things to look for is whether or not there is clear confluence with an existing horizontal support or resistance level. Simply stated, the more reasons people have to sell or buy into an area, the more likely they are to do it. Having confluence zones of support and resistance increases the probability of the diagonal trendline holding. Personally, I would consider this a requirement, though this is not always the case. Its yet another reason people have to enter a position, so it could potentially help when you’re looking to fade a diagonal trendline, yet certainly not first on our list. Generally speaking, fibs found from longer timeframes will typically hold more significance than those on lesser. So the bigger the fib the bigger the relevance, and the more confluence of factors coming into play the greater the probability of the trade. Again, the more reasons people have to buy/sell into an area, the more likely they are to do it. Fibonacci retracements are just another one of those reasons. It’s not uncommon that a trendline will register direct hits, get surpassed slightly, and then resume direct hits again. The simple explanation for this is that intraday noise occurs or price objectives are simply being traded into (support and resistance levels, outstanding orders, etc.) before the trend resumes. Don’t disqualify a trendline because it has been simply passed by a small fractional amount. For a downtrend, wait until price dips back above it (if drawn below), ensure that lower lows are being made, and wait until it gets approached again. To disqualify a trendline it simply needs to get fully broken, and ideally used in the form of a backward bounce as support or resistance. Like anything else, it’s recommended that you don’t get caught up in intraday noise if you’re going for longer term trades. Always perform a multiple timeframe analysis to make sure you don’t miss anything. Having the full picture is essential, and its one of the many reasons that many traders lose money on a daily basis. It is recommended that, particularly when viewing smaller timeframes (eg 1 and 5 minute) , you draw only direct hits on trendlines. 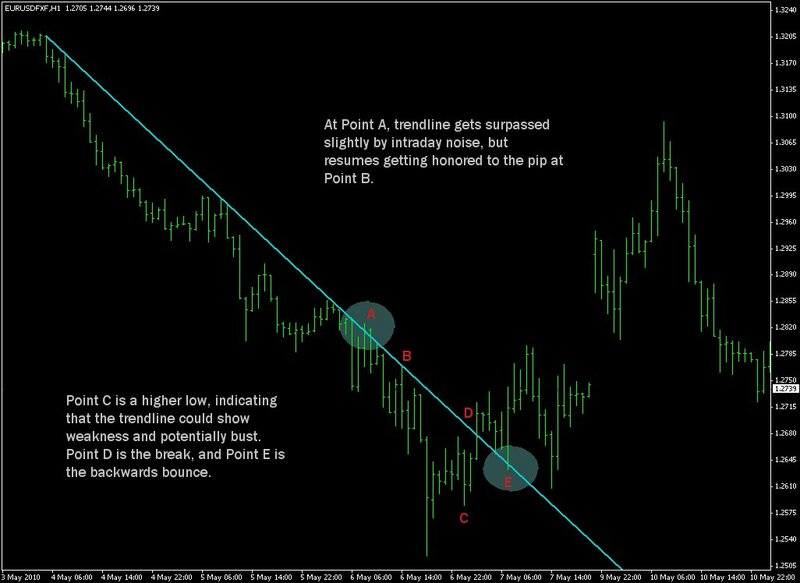 Due to the highly technical nature of what it is we’re looking to trade, sometimes just a matter of pips can mean the difference of something you missed versus what it is you have actually seen. Again, larger timeframes typically take precedence (1hr, etc), so don’t get caught up in the noise. Before you read this section, please read all of the above first. Like anything else in trading, missing pieces of information typically mean the difference of success or failure. This is a full-circle approach. 1. To judge the extinguishment of a current trend. Fanning trendlines will give us a very good idea of whether or not a trend is about to call it quits. Many times, the current trend will become parabolic, at which point your trendlines become progressively steeper (recommended at least 3 or more). Drawing a trendline on the steepest of these moves will eventually lead into a major support and resistance level, which you’re looking to fade. When using this methodology, be sure you’re not being too liberal in the definition of the word ‘parabolic’. We’ve all seen it, and know very well what it looks like. Simply stated, after the third touch on the final trendline, and only in a situation such as this, you’re looking to fade. Just as in the example above, your trend becomes parabolic, and you’ve plotted progressively steeper trendlines (recommended at least 3 or more), but when price hits your major support or resistance level below or above, you miss entry or simply feel uncomfortable doing so (you’re not a ‘falling knife’ catcher). Playing a backwards bounce off of the steepest of these trendlines could help you out in this regard. It is recommended that you call it quits after the third touch on a diagonal trendline in terms of direct hits. 4th, 5th or 6th touches generally increase risk, though I might consider entering on a stacking bricks pattern in such a case should the touch prove valid. Like anything else, those found on larger timeframes will hold greater precedence, so try not to get caught up in the noise. People generally associate the word ‘breakout’ with ‘something you don’t have to fear as much’ or ‘no drawdown’ because you’re moving in the direction of price, but the fact is that breakouts can be extremely risky if you don’t know what you’re doing. Most of the time they carry greater risk of loss due to the simple nature of the market. In fact even in the case of a breakout, you’re looking to get positioned ahead of the breakout on a pullback, which is in and of itself the form of a fade. 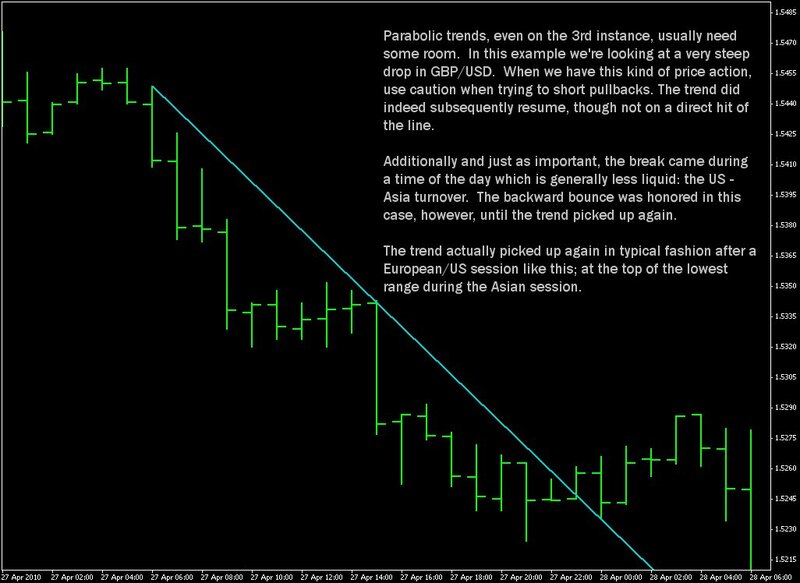 Breakouts on trendlines can certainly be done, but with skill and only under the right circumstances. In ANY circumstance, it is recommended that the trader gets positioned before the breakout occurs in the event that the breakout is false, and the trendline does indeed hold again. Like a normal support and resistance level, the more times a diagonal trending gets hit, the greater significance it holds. The greater the significance, generally speaking, the greater shot of a forceful breakout when it finally comes. It’s generally not recommended that you play a direct breakout (different than a backward bounce or retest) as the majority of the time, price is in a consolidated phase anyway and will likely come back for a backward bounce or retest. Rarely, in larger timeframe circumstances, will price simply break out of a trendline without ever saying ‘hello’ again, but it certainly sometimes does. For breakouts, the same rules apply as with any other…..more than 3 touches, the more the merrier, get positioned before it happens, in a downtrend: lower highs, in an uptrend: higher lows. On smaller timeframes, these breakouts can become more prevalent, particularly around key area, though only after 3 touches have already been made. Additionally, breakouts on trendlines could many times simply mean that price comes up and attempts to retest a larger, more prevalent trendline. 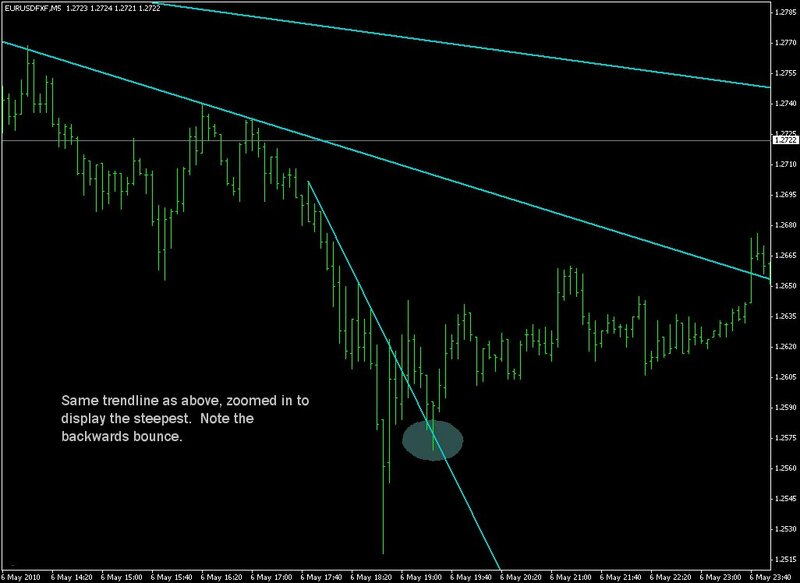 Diagonal trendlines can be used as both as guide or direct trading. In practice, it is suggested that you take time actually getting used to them before putting them in action. This usually requires may hours of observation before you truly get comfortable. Like anything else, look out for news releases that could potentially ruin otherwise favorable outcomes. Understanding them in conjunction with other tenets of trading can help you substantially, though more liberal practice and bending or disregarding rules typically has the opposite effect.